Any confidence boost that might have followed Theresa May's triumph this week over her party's implacable Brexiteers has probably already faded. Because if there was anything to be learned from the stunning rebuke delivered to the prime minister by EU leaders on Thursday, it's that the prime minister is looking more stuck than ever. This was evidenced by the frosty confrontation between the imperturbable May and her chief Continental antagonist, European Commission President Jean Claude Juncker, which was caught on film on Friday shortly before the close of a two-day European Council summit that descended into bitter recriminations. After offering token praise of May's leadership, Brussels' supreme bureaucrat criticized her negotiating strategy as "disorganized", provoking a heated response from May. Earlier, May desperately pleaded with her European colleagues - who had adamantly insisted that the text of the withdrawal agreement would not be altered - to grant her "legally binding assurances" May believes would make the Brexit plan palatable enough to win a slim victory in the Commons. If there were any lingering doubts about the EU's position, they were swiftly dispelled by a striking gesture of contempt for May: Demonstrating the Continent's indifference to her plight, the final text of the summit's conclusions was altered to remove a suggestion that the EU consider what further assurances can be offered to May, while leaving in a resolution to continue contingency planning for a no-deal Brexit. Even the Irish, who in the recent past have been sympathetic to their neighbors' plight (in part due to fears about a resurgence of insurrectionary violence should a hard border re-emerge between Northern Ireland and the Republic of Ireland), implied that there patience had reached its breaking point. But Leo Varadkar, the Irish premier, warned that the EU could not tolerate a treaty approval process where a country "comes back every couple of weeks following discussions with their parliament looking for something extra...you can’t operate international relations on this basis." Mr Varadkar noted that many prime ministers had been called to Brussels "at short notice” for a special Brexit summit “on a Sunday in November," adding: "I don’t think they would be willing to come to Brussels again unless we really have to." Given that Mrs May aborted a Commons vote on her deal this week because she feared defeat by a "significant margin," her comments amounted to a threat that she would let MPs kill the withdrawal agreement before Christmas. "At the point where there is no prospect of getting anything more from the EU, that’s when you would have to put the vote," said one close aide to Mrs May. If this week has taught May anything, it's that her plan to pressure the EU into more concessions (her preferred option to help her pass the Brexit plan) was an unmitigated failure. 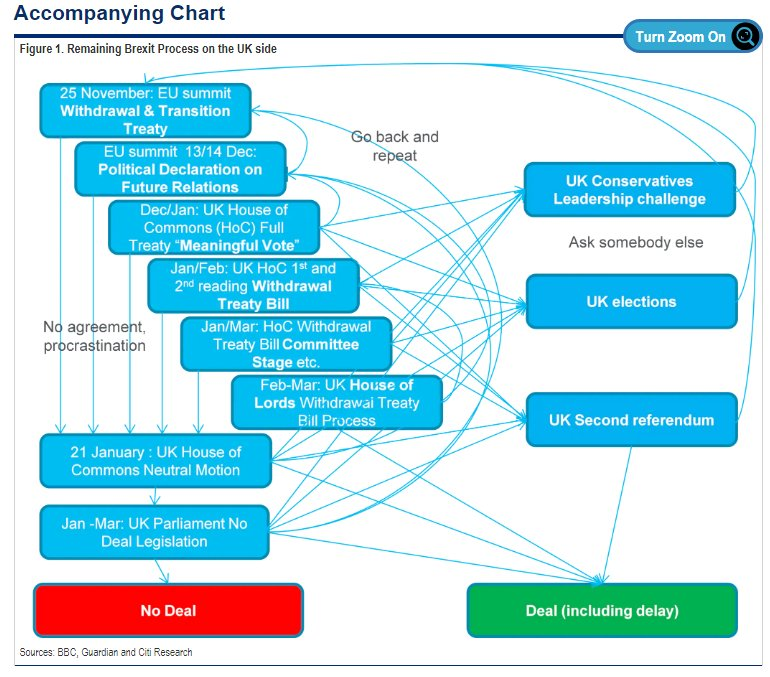 And given that running out the clock and hoping that MPs come around at the last minute (when the options truly have been reduced to 'deal' or 'no deal') leaves too much room for market-rattling uncertainty, May is left with a few options, two of which were previously 'off the table' (though she has distanced herself from those positions in recent weeks). They are: Calling a second referendum, delaying a Brexit vote, pivoting to a softer 'Plan B' Brexit, or accepting a 'no deal' Brexit. As the BBC reminds us, May is obliged by law to put her deal to a vote by Jan. 21, or go to Parliament with a Plan B. But on the other hand, she could go for a so-called Hard Brexit (where few of the existing ties between the UK and the EU are retained) and risk causing untold damage to the UK's economy and standing in the world for years to come. Alternatively, May could accept the fact that convincing the Brexiteers is a lost cause, and try to rally support among Labour MPs for a 'softer' Brexit plan, one that would more countenance closer ties with the EU during the transition, and ultimately set the stage for a closer relationship that could see the UK remain part of the customs union and single market. Conservatives are also increasingly pushing for a 'Plan B' deal that would effectively set the terms for a Norway- or Canada-style trade deal (and this strategy isn't without risk, as any deal accepted by Parliament would still require approval from the EU). But as JP Morgan and Deutsche Bank anticipated last week, a second referendum (which supporters have nicknamed a "People's Vote") is becoming increasingly popular, even among MPs who supported the 'Leave' campaign, according to Bloomberg. The argument for a second referendum advanced by one minister was simple: If nothing can get through Parliament -- and it looks like nothing can -- the question needs to go back to voters. Putting pressure on Brexiteers is also the reason there’s more talk of delaying the U.K.’s departure. At the moment, many Brexit-backers are talking openly about running down the clock to March so they can get the hard Brexit they want. Extending the process -- which is easier than many appreciate -- takes that strategy off the table. "The last 24 hours have shown that Theresa May's Brexit deal is dead in the water," said Labour leader Jeremy Corbyn. "She's failed to deliver any meaningful changes. Rather than ploughing ahead and recklessly running down the clock, she needs to put her deal to a vote next week so Parliament can take back control."